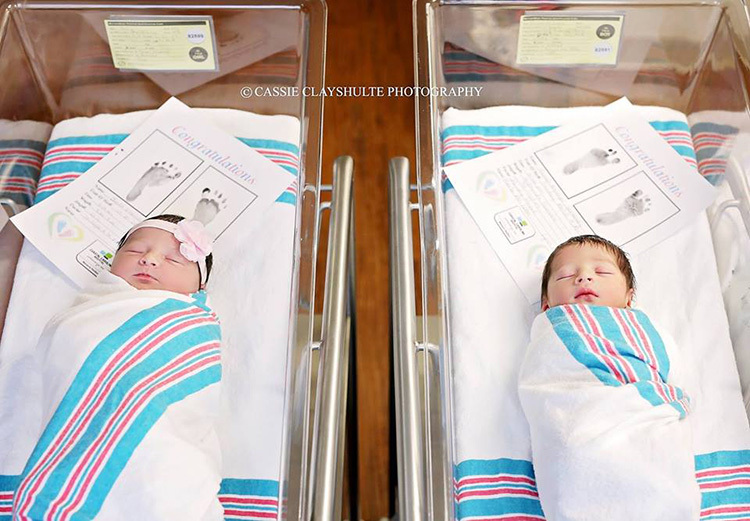 This week in Bluffton, South Carolina, two babies were born just hours apart in the same hospital. The rooms were right next to each other. The families had never met until after both babies were born. Meet Romeo and Juliet. "Sunday afternoon in Bluffton, South Carolina at 2:06pm, Morgan and Edwin Hernandez welcomed their baby into the world and named him Romeo," photographer Cassie Clayshulte wrote. "18 hours and 8 minutes later, in the next room, Christiana and Allan Shifflett welcomed a baby girl and named her... Juliet! Both parents had picked these names out early on in their pregnancies and neither couple knew each other until they met today! Both babies have full heads of hair and already make the cutest couple!"